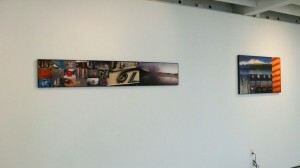 Photofield 75 "The Curious Rainbow Speaks" 44" X 96"
Michael starting making art as a teenager. He received a BFA from California College of the Arts (formerly CCAC) and an MFA from Ft. Wright College in Spokane, Washington where he taught Modern Art History, Painting and Drawing for a year before heading to New York. Barnard has worked in many media over his career. 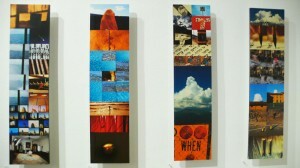 For the past 10 years he has focused on creating large photographic montage works he calls Photofields. Please go to www.photofields.com for more detailed information. His work can be found in numerous private collections around the U.S.A., and he recently installed a commissioned array of twelve 2′ X 8′ Photofields in the Reference Area of the beautiful new Lewis Library and Technology Center in Fontana, California. 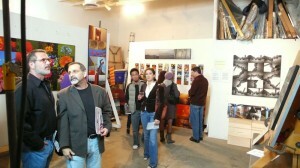 His most recent one-person exhibition was at the R Street Gallery in Washington D.C. in Nov.-Dec. 2008, and he was also the featured artist at the 18th Street Arts Center’s 20thAnniversary fundraising dinner held on April 11, 2009. 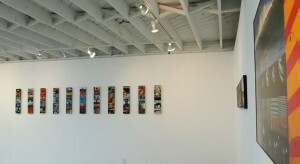 11 of the small versions of the Fontana Photofields (2008). 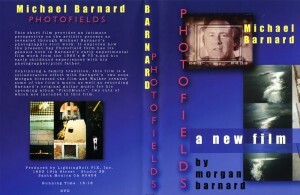 Outer cover for the DVD of the short film about Michael W. Barnard and his Photofields.